Estimating the impact a company has on climate change purely based on its greenhouse gas emissions may be incomplete, according to research. 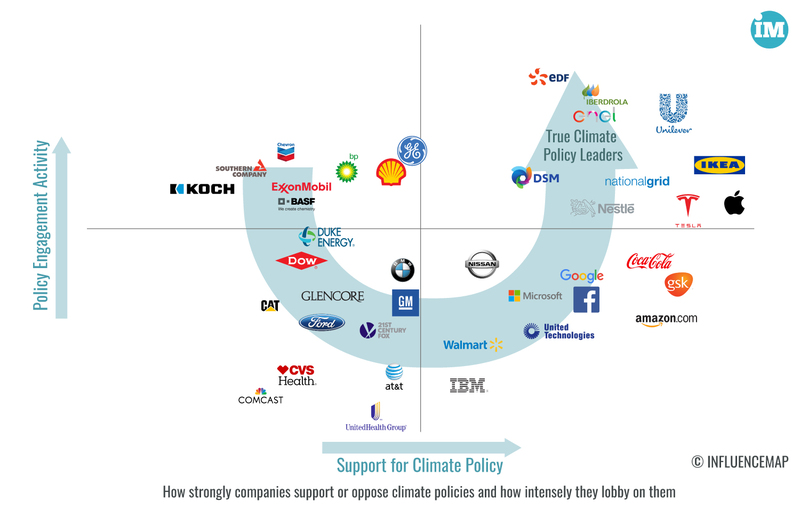 For some companies an equally, if not more important, impact could be their influencing of climate-related public discourse and policy from governments around the world. This may be the case for the politically powerful oil majors. For example, last month Harvard researchers found that ExxonMobil has misled the public over multiple decades on climate, a factor not currently reflected in mainstream financial climate metrics. 35 of these of the 50 most influential are actively lobbying against climate policy. They include companies in the fossil fuel value chain, heavy energy users, electric utilities with large amounts of coal generating capacity. On the other side, 15 of the 50 most influential are pushing for an ambitious climate policy agenda, favouring renewable power and electric vehicles. They include signatories to the RE100 initiative committing to buying 100% renewable power and renewable energy generators. InfluenceMap’s research shows the group of active and pro-climate companies has expanded noticeably in the last two years since the Paris Accord and the 2016 US election. This trend will likely continue as more large corporations around the world make the case to governments for an ambitious and consistent climate-related policy pathway to help them meet their decarbonisation goals cost effectively.